In this Dreaming story much of the west side of Alice Springs has an association with a dog fight. 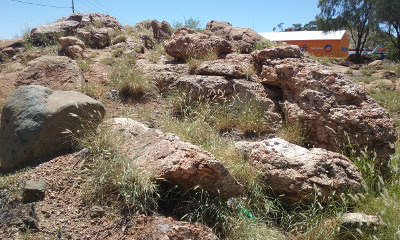 After reading a little booklet about this I initially climbed Anzac Hill and took some photos. But, subsequently, I found I could get better shots of the features I wanted from Billy Goat Hill and Annie Meyer Hill, so I'll show you those pics. Most of the features of the Mt Gillen ridge were formed by the activities of the wild dog. There was an extended battle between a local dog and an interloper from the west, or in some versions from the south-east. They fought over a female. Various features of the ridge are named after the resting place of the female, dog hair released during the fight and intestines from a wounded dog. The fighting raged to Heavitree Gap, where the intruder was finally beaten and buried. Heavitree Gap (Ntaripe) from Billy Goat Hill (Akeyulerre). 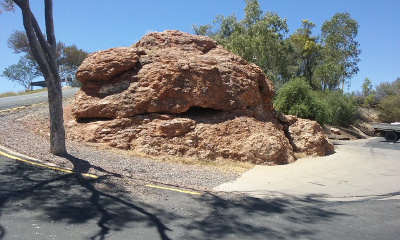 After defeating his antagonist at Heavitree Gap, the wild dog creator being metamorphosed into a boulder embedded near Billy Goat Hill. I looked for that boulder but couldn't find it. 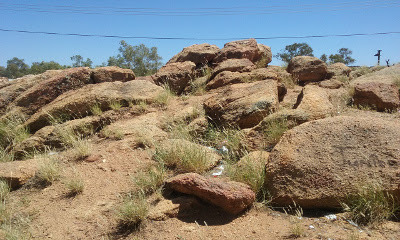 At various locations nearby are rocks that represent the puppies of the adult wild dogs. Some of the puppies are at the back of Beaurepaires, which is near Anzac Hill. 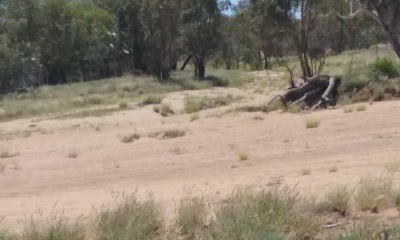 No water today, but this is where Charles Creek flows into Todd River. 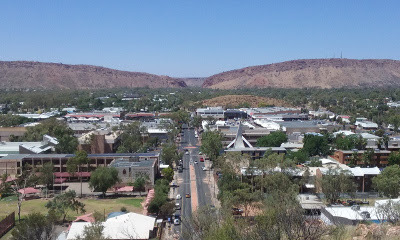 They say you are not a true resident of Alice Springs until you have seen the Todd flow three times! 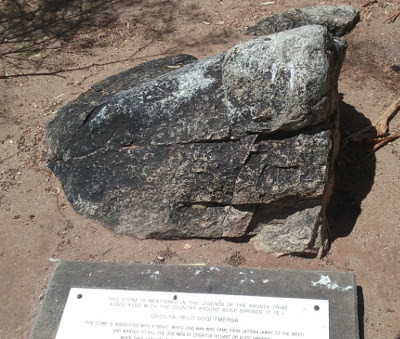 The stone below is associated with a great, white, dog man who came from Latrika (away to the West) and wanted to kill the dog men at Choritja (Stuart or Alice Springs). So he sat down quietly and remained there, the stone arising to mark the spot. If the stone is rubbed by old men all the camp dogs begin to growl and grow fierce. The last man to rub it was one of the old inkatos (headmen) who did so soon after the white man came in order to try to make the dogs bite them.